Sometimes I stumble upon a book that charms me beyond measure. It may have been written really well, or the subject matter is dear to me and I wish I had the wherewithal to write such a piece, or simply because the book is so refreshingly different. Zeeshan Khan’s Right to Passage, Travels through India, Pakistan and Iran is more than the sum total of these. Zeeshan Khan decided to travel from Bangladesh to India, Pakistan and Iran along an old, interesting route that served as a historical marker for cultural and territorial continuity. The divisions of the Indian sub-continent are recent, and have resulted in the three ‘new’ nations of India, Pakistan and Bangladesh. Yet, there is much that shared by these nations – culture, history, food, beliefs, religion, music and the arts, and Zeeshan embarks on a journey to connect the dots. Among other places, in India, Zeeshan’s travels take him to Patna, where he tries to find the legendary Patliputra, Nalanda, Bodh Gaya, the birthplace of Buddhism and Amritsar, the seat of Sikhism in India.In Pakistan, he travels across the country, from Lahore, Karachi, Taxila, Peshawar to Multan and Quetta, while in Iran, Zeeshan covers towns of Neyshabur, Esfahan, Tabriz, Teheran and many more. Right to Passage is more than a historical account of these places though. Zeeshan has interesting observations in each of the places he visits. On how each place smells different, how facial similarities converge and diverge, what is common in religious rituals across the world, and how things change and remain the same! India, Zeeshan finds, has a competitive and meritocratic bureaucracy; there are civil society actors, promoters of civic sense, human right defenders, environmental activists, watchdogs, gatekeepers,checks, balances and all sorts of enthusiastic efforts to inject ideals into a world that attempts to avoid having any every chance it gets. Zeeshan finds that the sense of entitlement that gets his work done in Bangladesh and India, does not work in Pakistan. People here speak to and expect to be spoken to with a degree of respect; there is an egalitarianism about the way they interact with each other and a basic amount of courtesy seems to be built into most conversations, regardless of rank or station. He also discovers that Pakistanis are more honest and forthright about their political views, and 63% of Afghan refugees have found a home in Pakistan, the designated villain! Perhaps the biggest surprise for Zeeshan was Iran. The Islamic State is not the monster it is made out to be. He comes across great infrastructure, incredible politeness and hospitality in Iran, and as he leaves it, he feels as though I’m coming away from a precious reunion with loved ones, after decades apart, and I experience a sort of separation anxiety that makes me slightly forlorn. What I loved the most about Zeeshan’s book – that he chooses to not focus on the negatives. There is much that is wrong in all our states – from not taking care of our heritage, religious and caste divisions, inept and incompetent governments and the growing menace of Islamic and Hindu radicalism. Yet, Zeeshan showcases the reasons we must celebrate our nations. The Right to Passage must be everyone’s right because the shared culture and history go beyond modern boundaries and loyalties. 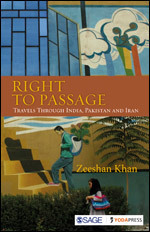 Right to Passage is a veritable feast to rediscover the forgotten histories of India and Pakistan and discover fresh insights into (among other things) the unique Balochi and Pashtun character, Persepolis, Omar Khayyam, Khawaja Hafez, Shams Tabrizi, Hammurabi’s code, subtle Persian food, the origins of the Parsis and much more. There was so much I re-discovered, and so much that I had never known, and this feeling of not knowing enough haunted me long after the book was over. My copy of Right to Passage looks like some toddler got his hands on it – it is blue and red with underlined, highlighted passages, and notes that I wrote to remember certain things. It is that kind of book – the kind you want to keep for a long time! Read this book people…. it will expand your horizon! This entry was posted on June 22, 2016 by Preeti Singh in Non Fiction, travelogue and tagged india, Iran, pakistan, Right to Passage, Sage Publications, travelogue, Yoda Press, Zeeshan Khan.